Initially I thought you are free thinker. If someone show supernatural power , you will follow him blindly . Dear Anonymous, Your comment is funny. :D You didn't get what I mean. 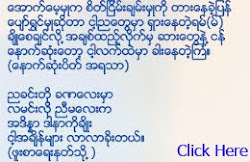 အစိမ္းေရာင္ေတြ ပစ္ေတာ့.. ေရႊဝါေရာင္ေတြ ေသတယ္ ။ ... သၾကားမင္းက မ်က္မွန္ေရာ ၀ရဇိန္ပါ ရွာေနတုန္းပါ ..